Debra Goldman is a Tea Party member of the Wake County School Board, and she wants to move up this November to become the state's Auditor, a member of the Council of State. She's clearly unstable, based on details in this leaked police report. 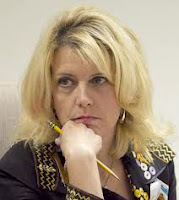 Chris Malone is another Tea Party member of the Wake County School Board who got himself involved romantically with Debra Goldman (see the link above). Chris Malone also wants to move up politically. He's currently running for a seat in the NC House. But he's an idiot for getting himself so wrapped up in the drama of Debra Goldman. Just the sort of people we need serving the public in North Carolina. You're right! Why they even remind me of Bill Clinton if there is anything to this. JW, based on your posts over the years, anyone who does not agree with you is unstable.